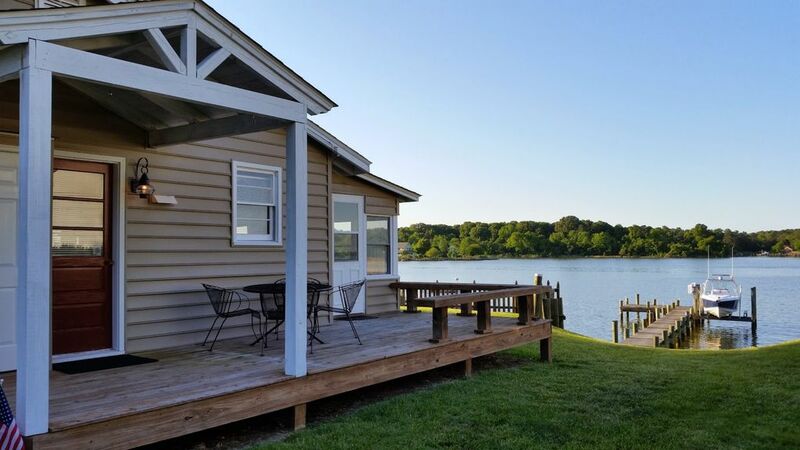 Waverly Cottage on Cobb Island, Maryland is a beautiful waterfront property offering a grand view of the quiet waters of Neale sound and Wicomico River. Surrounded by the Potomac River, Wicomico River and Neale Sound this small residential island is the ideal location to enjoy the natural beauty and coastal waterways that grace southern Maryland. This delightful, newly renovated cottage is fully furnished with two bedrooms, a full bath, spacious eat-in kitchen, family room and enclosed porch creating a relaxing coastal atmosphere. Cottage is equipped with central air conditioning and heat and ceiling fans. The master bedroom has a large queen bed, while the second bedroom is outfitted with two twin beds. The fully equipped kitchen with new appliances easily accommodates a gathering at the large dining table. The open family room with sofa, loveseat and rattan side chairs for plenty of seating is newly refreshed in a coastal inspired and relaxing style. Cable television and VCR as well as Wifi are provided for family viewing and convenience. The cottage has an entry/dining deck with an enclosed porch on the front with plenty of seating to view of both the sunrise and sun set over the water. The terraced yard leading to a 100 foot pier and dock offer great opportunities to watch the passing boats while crabbing, fishing and swimming. Traffic is very light on Cobb Island making it perfect for biking, walking and enjoying the native wildlife (osprey, herons, swans and ducks) adding to the serenity of the peaceful waterside. A wonderful community playground is just a five minute walk away while the Cobb Island Grocery Store, The Cove Coffee and Wine Bar and Cobb Island Marina/Ledo's Pizza are also located nearby on the island. For dining out and a taste of local seafood try Captain John’s Crab House/Marina, Shymansky’s Restaurant, or Olde McDonald's Country Store that are located just over the bridge. To satisfy your touring spirit, Cobb Island is within easy driving distances of the museums and monuments of Washington DC, historic Mt. Vernon and Woodlawn Plantations in Virginia, the Civil War Battlefields of Fredericksburg, Virginia and St. Mary's City (early settler's village) in southern Maryland. Sail and motor boaters can make short day trips to various sites within the Potomac River watershed. NOTE: Waverly Cottage is complemented by Cranberry Cottage, a one bedroom rental on the adjoining property thereby providing an opportunity to vacation with family and friends in neighboring homes. See our listing for Cranberry Cottage at VRBO #6623. More details on this wonderful feature are available via telephone or e-mail inquiries. Just a short drive from the island is a public golf course at Swan Point. The cottage is all on one level to make for easy access throughout, however there is a short flight of 3 stairs in order to enter the cottage. Completely renovated cottage with fully equipped kitchen and newly furnished bedrooms and living room. Ceiling fans and central air condition/ heat pump. WiFi access and HDTV Cable available. Enclosed porch and outdoor dining deck with extensive lawn area. Gas BBQ grill and a private pier that can accommodate boats up to 40 feet long. What can I say. There is just something about water. I could sit & enjoy it all day. This cottage had everything you need to relax & enjoy a home away from home. We stayed for a short visit this time & hope to be back to enjoy it for a longer stay. Thank you for supplying everything needed for our comfort. Love the decor, updated home, and ease of the location. This was our second stay at Waverly Cottage and we loved it even more the second time. This place is so peaceful and relaxing. House had great amenities. We will definitely be back!!! You are welcome to come visit us on Cobb island any time! Great spot. Fantastic view. The cottage is cozy and immaculate. Tastefully renovated and appointed. We were here to visit my brother and his family on Cobb Island. This cottage is perfect for us. We will stay again! I'm glad you enjoyed your stay and hope you return again soon. calm and peaceful; away from it all; watch boats go by, watch the Bald Eagles/great blue herons/ducks/cormorants/gulls. local eateries provide a taste of southern Maryland (NO CHAINS immediately nearby!). House is perfect little cottage - extremely well-stocked, clean and tidy. Freshly painted and furnished. There's a nice Sony HDTV if you must. No "glitches". Thank you very much for the very kind review. I'm glad you enjoyed your stay on Cobb Island and invite you to return again! This place was perfect for my wife and 2 young boys. Very peaceful and beautiful views. Me and the boys enjoyed the fishing! Great neighbors. Lou, thank you so much for the positive review. So glad you and your family enjoyed your visit to Cobb Island. Please come stay with us again! tranquility and hospitality at its finest. Very relaxing environment right on the water. Highly recommended. Will be back next fall for sure! Thanks for the positive review.......please come back and enjoy the island anytime! Fishing; crabbing; swimming; kayaking; windsurfing; hiking; museums; sightseeing;sailing;jet sking; local restaurants (3); Art Gallery and Coffee Shop on the Island; wildlife viewing--especially bird watching; antiquing.